Miley Cyrus has always been close with her parents, so when the singer and her mother decided to spend some quality time together this week, they headed over to the tattoo shop for some mother-daughter tattoos. Miley Cyrus’ new tattoo is located on the inside of her forearm, and features the name of one of the singer’s biggest idols, Elvis Presley, inked in the shape of a heart. 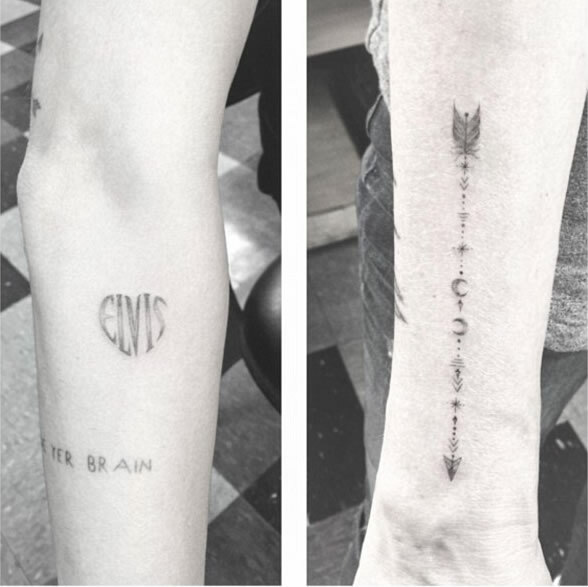 While Tish’s tattoo is located in the same spot as Miley’s, the 48-year-old opted for a unique piece – an intricate line and dot tattoo featuring an arrow and crescent moon design. One of Miley Cyrus’ favorite tattoo artists is Dr. Woo of the Shamrock Social Club in West Hollywood, California, and she commissioned the talented artist to ink her Elvis arm tattoo. Dr. Woo posted a photo of Miley’s new tattoo on Instagram on April 9, along with the caption, “Last nights momma daughter vibes with Miley and Tish.” Miley has amassed quite the collection of tattoos over the years, and this Elvis arm tattoo makes number 43 for the pop star, who’s most recent tattoos include a puppy dog face and a “KATZ” friendship tattoo dedicated to best friend Katy Weaver. Rumor also has it that Miley may have gotten a tiny “leetle” tattoo at Fun City Tattoo in Manhattan on March 30th with pal and Flaming Lips singer Wayne Coyne. Still just a rumor at this point, until we get some pics. Miley obviously got her love for tattoos from her mother, who is covered in ink herself, including tattoos on her side and ankle, and a large angel wings piece covering her back. The singer has no problem going under the needle for people who play an important role in her life, including her brother, her grandmother and her best friends. She also loves getting inked in honor of celebrities she admires, and recently got an “I’m in your corner” tattoo on her arm as a tribute to Johnny Cash. It’s no surprise that Miley Cyrus’ latest tattoo is an Elvis Presley-inspired piece. The 23-year-old’s Instagram is filled with pictures of herself posing with other people, whose faces she has swapped with Elvis’, and during an interview she gave in 2014, Miley talked about the double-standard among celebrities in Hollywood, comparing herself to the King of Rock and Roll. “Elvis, he wasn’t wearing the outfits I was wearing but he was coming out and he was doing like the OG twerking.” By getting her new arm tattoo, Miley is honoring Elvis Presley in the most permanent way possible.